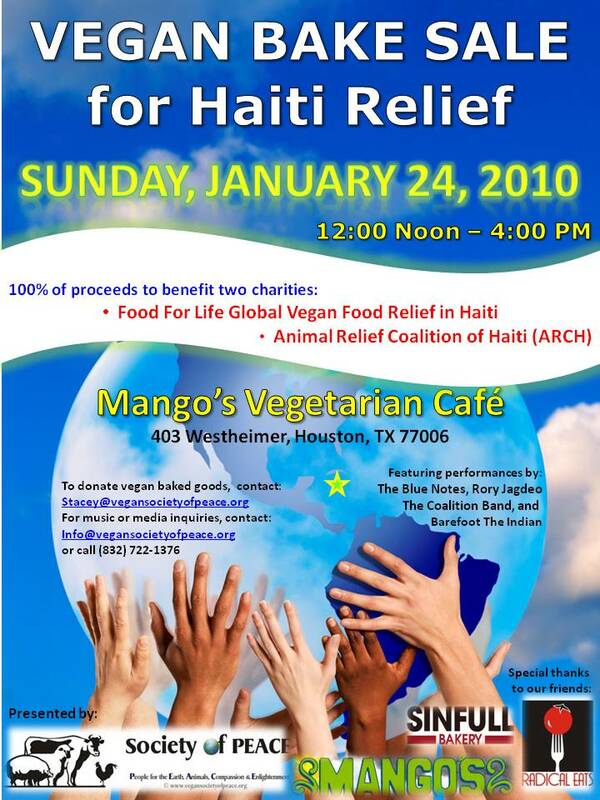 PLEASE SUPPORT OUR VEGAN BAKE SALE FOR HAITI RELIEF ON SUNDAY, JANUARY 24 IN HOUSTON! Join members of the Houston Vegetarian Meetup for their next social luncheon. The group will be gathering on Saturday, January 2, 2010 at Baba Yega Restaurant in Houston. This restaurant offers a variety of vegan options. The event begins promptly at 11:00 AM and seating is limited. Please RSVP online at the Houston Vegetarian Meetup. The Houston Vegetarian Meetup is organized by Society of PEACE members Michelle, Mari, Robert & Lisamarie. Join members of the Houston Health Association/Natural Hygiene Network for their monthly meeting. This month, there will be a special New Year potluck. The event will begin at 5:30 PM on Saturday, January 9 at The Briar Room, and will feature a short program and film about health. Please bring a healthy vegan entree, side dish or salad to share for the potluck dinner. RSVP's are requested by January 6th. Society of PEACE member Dr. Mamiko Matsuda is the organizer of this group. Please visit Houston Health Association to learn more, or call Mamiko at 713-622-6051.
Leisure Learning Unlimited presents "Save the Planet: Eat your Veggies RAW", featuring raw vegan chef & KPFT radio personality Pat Greer. The raw vegan class is on Sunday, January 10, 2010 from 1:00 - 4:00 PM in Memorial Park (I-10/Washington) in Houston. Pat will teach you how to have fun preparing and eating food that is made without any heat, such as pizza, lasagna, “re-tried” beans, pecan pie, and more. Make a green smoothie, a veggie parte' dip, marinated mushrooms, and a pecan dessert. Recipes will be provided. Join the Woodlands Vegan Meetup for their social Dinner on Thursday, January 21st at 6:30 PM. This month, the group will be meeting at Pizza By Marco in the Woodlands to enjoy some delicious vegan pizza! The Houston Animal Rights Team will be holding a meeting this month on Thursday, January 21. Attendees can learn about local leafleting opportunities, as well as organize upcoming protests and demonstrations in Houston. The meeting begins at 6:30 PM at the Houston Institute for Culture. Alma Williams is the director and organizer of HART, and is also a member of Society of PEACE. For more information, visit the Houston Animal Rights Team or call 832-380-4278. Houston SNAP (Spay-Neuter Assistance Program) is pleased to announce the Grand Opening of their Spay-Neuter & Animal Wellness Clinic. The public is invited to attend the Grand Opening Event on Friday, January 22nd at their new 4,500 square foot facility! Guests will have the opportunity to tour the new facility, where thousands more companion animals can receive services to help prevent pet overpopulation. The Grand Opening event is from 6:30 - 9:00 PM and is open to the public. For more information, visit SNAP, or call 713-862-3863, ext. 100. Join the Texas Humane Legislation Network (THLN) Southeast Chapter for their January meeting on Saturday, January 23 at 11:00 AM. They will be discussing upcoming events, legislative action for animals and fundraising. All are welcome to attend! The meeting will be held at the Houston SPCA. For more information, please email THLN Southeast Chapter President (and Society of PEACE member) Brian Craft. Join members of the Houston Veggie-Lifestyle Meetup for a social Dinner. This new group will be gathering on Saturday, January 23, 2010 at Quan Yin Vegetarian Restaurant in Houston. This vegetarian restaurant has numerous vegan options on the menu and offers primarily Asian-inspired cuisine. Society of PEACE will be holding a very special event on Sunday, January 24th in Houston! Due to the disaster in Haiti just last week, our first event of the New Year will be a fundraiser -- both for humanitarian aid and animal rescue. Next Sunday, January 24 from Noon - 4:00 PM, we'll be holding a VEGAN BAKE SALE FOR HAITI RELIEF. Mango's Vegetarian Cafe has graciously offered their venue to us during Sunday brunch hours! We'll also have live music from local bands and musicians like The Blue Notes, Rory Jagdeo, The Coalition Band, and Barefoot The Indian. Donated vegan baked goods are being provided by our friends at Sinfull Bakery and Radical Eats, as well as our wonderful volunteers and members! Our Society of PEACE Volunteer Team is moving quickly to organize a successful bake sale on short notice and need your help and support! All proceeds will go equally to two organizations run almost entirely by volunteers: Food For Life Global Relief, which is already on the ground to begin feeding vegan meals, and the Animal Relief Coalition for Haiti (ARCH), led in the US by Kinship Circle's Disaster Aid Network, in coalition with the WSPA & IFAW. If you are interested in donating vegan baked goods for this event, we'd love to hear from you! Please contact Society of PEACE Secretary Stacey Halsch. For questions about this event, or media inquiries, please call the Society of PEACE line at 832-722-1376, or you may email info@vegansocietyofpeace.org. Click on the event flyer above to download, print & share! The public is encouraged to attend and support this benefit event to help the people and animals of Haiti! Please invite your friends and family! All ages are welcome to attend! Join the Spring-Woodlands Raw Vegan Meetup for their monthly Potluck Dinner on Tuesday, January 26th. This month, the group will be meeting at a private residence in Spring to enjoy a delicious raw vegan potluck. The theme for this event is "Warming Winter Foods". PETA (People for the Ethical Treatment of Animals) will be in Houston on Thursday, January 28 to protest NASA's plan to blast up to 28 squirrel monkeys with a massive dose of gamma rays in order to "simulate" the space radiation. PETA's Action Team and area animal advocates will be protesting at the Johnson Space Center on Space Center Blvd in Clear Lake at 12:00 Noon. Signs and materials will be provided by PETA. For more information, contact DavidShirk@peta.org or call 206-818-0773. Join members of the Houston Vegetarian Meetup for their next social luncheon. The group will be gathering on Saturday, January 30, 2010 at Bhojan Restaurant in Houston. This restaurant offers Indian cuisine in a variety of vegan options. The event begins promptly at 11:30 AM and seating is limited. Please RSVP online at the Houston Vegetarian Meetup. The Houston Vegetarian Meetup is organized by Society of PEACE members Michelle, Mari, Robert & Lisamarie. The Vegetarian Society of the Bay Area is holding their monthly meeting & potluck Luncheon on Sunday, January 31. The event will begin at 12:30 pm and will feature a vegan potluck luncheon and door prizes. There will also be a short film screening on a related topic, as well as a book review. Leisure Learning Unlimited presents "Versatile Tofu: The Meat & Dairy Alternative", featuring vegan personal chef & KPFT radio personality (and Society of PEACE member) Staci Davis. The vegan cooking class is on Sunday, January 31, 2010 from 3:00 - 7:00 PM in Sharpstown area (SW Frwy at Fondren) in Houston. Staci will teach you how to make chipotle chili, vegetable lasagna, silk pies, bread pudding and much more.